$199.99 plus free ground shipping anywhere is the US. 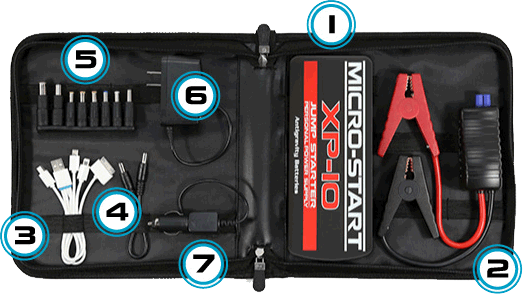 Safely and easily Jump-Start your car, truck or powersports vehicles. XP-10 has 300 Amps starting current with a massive 600 Amps Peak. It can start a V8 up to 30X on a single charge! Jump-start DIESELS up to 7L as well as vehicles with gas engines. The included Smart Clamps have a sturdy design with strong pivot points. They also feature multiple built-in protections. Conveniently Charge & Power your devices. TConveniently Charge & Power your devices. 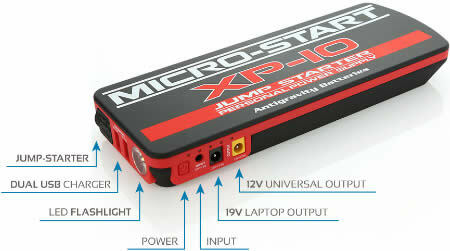 The XP-10 has a very robust capacity for back-up power: 18000 mAh! It has four ports to charge your electronics: a 19V for Laptops (not compatible with Apple 16V laptops), a 12V standard output (for GPS, mobile DVD players, small fans, LED lights, etc), and TWO 5V USB ports (for Smartphones, Tablets, Cameras, PSPs, MP3 Players, Bluetooth devices and more).